Does Your Humidifier Really Need a Filter? Do you find that your home is always arid and dry? Perhaps you sometimes notice your skin is becoming drier than normal? The cause of this might be the fact that your home has not found a proper balance in the levels of humidity required for a correct atmosphere! A humidifier is a wonderful invention that not only increases the levels of moisture within your home but also helps to purify the air and improve air quality.This improvement to levels of humidity in your home could also mean that certain ailments that plague you are reduced in their severity and symptoms rectified. So what is a humidifier and what purpose does it serve? What about the maintenance of a humidifier and its various internal components? Do you need to get it serviced yearly or purchase expensive replacement filters? Maybe a humidifier can run without one? Let’s find out! What are the Advantages of a Humidifier? Can I Use Humidifier Without Filter? Humidifiers are household appliances that when used correctly, can increase the levels of humidity in your home and remove unwanted dryness from the atmosphere. They are available in a variety of strengths and sizes, running on electrical power from your home’s internal wiring. Generally a box-shaped product, they have internal motors and wiring that is used to increase the levels of moisture in the air found within either a single room or the entirety of your home. They generally are larger objects and can be classified as portable or internal. Portable humidifiers can be moved via wheels to different areas of your home whereas internal humidifiers can be installed directly into your home’s internal air system. 1. Central Humidifiers – This style of humidifier is built directly into your home’s internal air system or heating unit. These humidifiers are the most expensive to purchase and install but can be considered an investment if you want to add humidity to each room of the residence. 2. Evaporators – This style of humidifier moves moisture through the air with the aid of a moistened filter. An internal system of wiring and fans move the wet air through the air of a single room; as it is a single unit or portable humidifier. 3. Impeller Humidifiers – This style of humidifier works with the help of high-speed rotating disks to increase the levels of moisture in a given room. They are considered by many to be the highest kid-friendly option, as they do not omit hot steam but a cool mist and all internal parts cannot be seen or touched. 4. 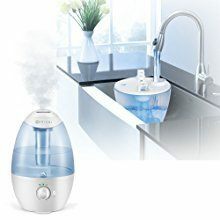 Steam Vaporizers – This style of humidifier works with the use of hot steam from heated water being converted to cool mist and being expelled in the air. While this option is the cheapest one, this style has been noted for causing burns from the heated water and accompanying steam. 5. Ultrasonic Humidifiers – This style of humidifier will produce a cooling mist in the air with the use of ultrasonic vibrations. They can be purchased in a variety of sizes and power with higher-end models giving the option for hot, moist air or a cooling mist, depending on the season. It is extremely important to run the humidifier only when the air in your home consists of a lot of dryness or you are experiencing symptoms throughout your body caused by dry air. Air that is too dry can increase existing health problems and also damage parts of your home by making them more susceptible to fires and other hazards. It is during the cooler, winter months that your home will welcome the presence of humidifier thanks to the change in temperatures and higher levels of dryness in the air due to a heat source running full time. They can alleviate certain conditions such as coughs, dry throat and nose, cracked and dry skin and sinus congestion and headaches. They can moisten the wooden furnishings and internal structures of your home to the appropriate levels to not grow mold but prevent the wood from cracking or splitting. They can aid people who suffer from sleep-related conditions and allow for a better night of sleep. The use of a humidifier in the bedroom has been clinically proven to reduce the level of snoringyourself or your partner does on a nightly basis. This can provide you with a better quality of sleep and replenish lagging energy levels, especially in the dull winter months. 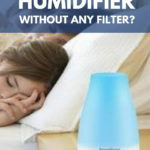 There are a variety of sizes and models of humidifiers on today’s market, that range from in-home systems for very arid climates to small box-shaped items that fit neatly in the corner of a chosen room within your home that is not only portable but also able to shut on and off by introducing or removing power from an electrical outlet to your appliance. It is crucial to remember to use a humidifier as instructed, as too much moisture in the air can lead to severe health problems or even threaten the internal structure of your home by aiding in the growth of mites and mold. You’re probably asking yourself ‘do you have to use a filter’? Like any other major household appliance, there is always maintenance involved in ensure your investment is working at top level. Humidifiers can run into the hundreds of dollars the more technical and bigger you need, so it is in your best interest to maintain your humidifier as per the detailed instructions. Most humidifiers do not require yearly or bi-yearly maintenance treatments, but it is always important to confirm this if you have a warranty policy on your humidifier. Most humidifiers, especially the evaporative cool mist models, need filters and run with an intricate filtration system, which filters the air coming out of the machine to control the levels of moisture being added to the immediate atmosphere. Without these filters, a humidifier could add higher than needed levels of moisture in the air to the machine, leaving the air quality extremely humid. Too-humid air within your home can lead to the growth of mold, which can threaten the strength and shape wooden materials in your home, allowing them to be more to collapse. It can also be damaging to the human body, as it can aid in respiratory problems and increase the symptoms of skin conditions. These wet levels will create an entirely different set of health issues that a lack of moisture does not, so a humidifier could be necessity to maintain the perfect balance needed in air quality in a home. Some models of humidifiers does not use a filter during operation but they should be equipped with a water-purification system that stops dirty, moist air from being released into your home. It is important to consult with the manufacturer of your humidifier to determine if and when the filter in your system should be replace. These filters not only help the machine add the correct levels of moisture in the air but can also act as an air purifier if you add drops of a scented essential oil to the water. Filters can generally be washed in soapy and warm water for maintenance and then reinserted into the humidifier to begin removing irritants from your home all the sooner. Check with your instruction booklet to determine how often to clean and eventually replace the filter that comes with your chosen model of humidifier. There is generally little maintenance or repairs that need to be done with a humidifier, but it is always important to check over the machine before use. Cleaning a humidifier is easy enough, too. Ensure that the water compartment is empty and use a disinfecting cleaner to wipe each corner and crevice free of potential built-up mold. Use a vacuum cleaner to remove dust and debris from the exhaust ports of your humidifier, which can become clogged over time and emit particles into the moistened air. If dust, debris and allergens are all exhaust ports of your appliance, they can attach themselves to the walls and linens of your home due to the increased levels of condensation. Wash the filter in your humidifier in mild soap and warm water to remove any dust or debris that could clog the filter and not only allow mites to be released back into the air, but also cause the machine to work overtime and produce a higher level of moisture than desired. If this happens frequently to the humidifier, it becomes a source of irritation and an expensive item to replace or you may have to purchase a dehumidifier to balance the levels of moisture in your home. Now that you know it would be impossible or irresponsible to actively maintain the levels of moisture in your home without a humidifier that has a filtration system, perhaps you are interested in purchasing a humidifier or upgrading your current model. 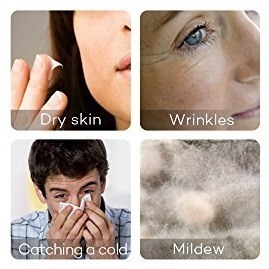 Humidifiers can aid you in the long-term maintenance of your physical being and provide relief to those who suffer from allergies or common colds. If you suffer from allergies or skin conditions that seem to increase in severity during the cooler months, then maybe a humidifier is something you should look at investing in. The Environmental Protection Agency recommends a humidity level of less than 60% in the summer and a 25-40% level during cooler months to maintain the perfect balance. With a variety of models, styles and sizes available on today’s market, there should be a humidifier out there for you! Check out the selection at your local hardware store or browse through the numerous online shops catered exclusively to home air-quality improvement. As with any major purchase, check out the customer return policy, warranties and maintenance costs before committing to a retailer. If you find a particular model of humidifier has worked well for you and your household or you would like to share this information with family and friends that may in the dehumidifier market; please feel free to leave this in the comments below! Exactly How Does A Furnace Humidifier Work?